As an exotic protein, Kangaroo is the healthiest pet food, rich with twice the Vitamin B12 of other meats. Kangaroo also acts as a great puppy food start, perfect for elimination diets to combat any pet food allergy your pup may have. 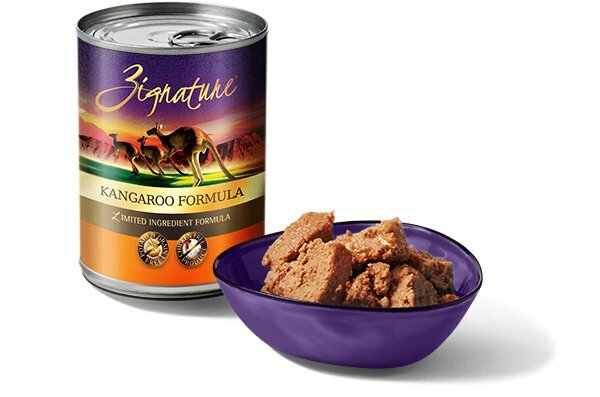 Coming from Australia, packed with Omega-3 fatty acids, Kangaroo makes a fantastic limited ingredient dog food. By adding the proper vegetables to our Kangaroo Formula dog food, and by keeping it grain free, we’ve created the perfect hypoallergenic dog food that many consider to be the healthiest dog food on the market. Kangaroo, Broth, Peas, Sunflower Oil, Carrots, Chickpeas, Agar-Agar, Sun-Cured Alfalfa Meal, Choline Chloride, Salt, Tricalcium Phosphate, Calcium Carbonate, Potassium Chloride, Cranberries, Blueberries, Minerals (Zinc Proteinate, Iron Proteinate, Copper Proteinate, Manganese Proteinate, Sodium Selenite, Calcium Iodate), Vitamins (Vitamin E Supplement, Thiamine Mononitrate, Niacin Supplement, Calcium Pantothenate, Biotin, Vitamin A Supplement, Riboflavin Supplement, Vitamin B12 Supplement, Pyridoxine Hydrochloride, Vitamin D3 Supplement, Folic Acid).